STS. CYRIL AND METHODIUS RUSSIAN ORTHODOX CHURCH. Significant for its architecture, the Russian Orthodox church originally called "Saints Cyril and Methodius Russian Orthodox Greek Catholic Church" was first built in Hartshorne in 1897 at Third and Modoc streets. It was erected on a place deemed "Russian Hill" because of the nationality of its residents. The original Carpatho-Russian parishioners of the church had immigrated to the United States and then came to Hartshorne, in the Choctaw Nation of Indian Territory, to mine coal. In 1917 they constructed the present building, and the parish reached its high point in membership with seventy-five families. The red brick church's design, reminiscent of St. Basil's Cathedral in Moscow, includes stained-glass windows and three "onion" domes topped with crosses. With the onset of the Great Depression and the decline of coal mining, many members of the church left the area to search for other employment. At the beginning of the twenty-first century the church had an average of ten worshipers every Sunday; most of these faithful were elderly. The edifice remains an important reminder of the impact of coal mining on the state's diverse religious and ethnic heritage. Sts. Cyril and Methodius Church is Oklahoma's only representative in the Orthodox Church in America, Diocese of the South. Michael Hightower, "The Road to Russian Hill," The Chronicles of Oklahoma 63 (Fall 1985). "Sts.Cyril and Methodius Russian Orthodox Greek Catholic Church, Hartshorne, Oklahoma," Church Histories, Pittsburg County, D.A.R. Files, Research Division, Oklahoma Historical Society, Oklahoma City. Gary L. Watters, "From Russia to Oklahoma: A Case Study of the Immigrant Experience" (M.A. thesis, Oklahoma State University, 1974). William Lynch, "Sts. 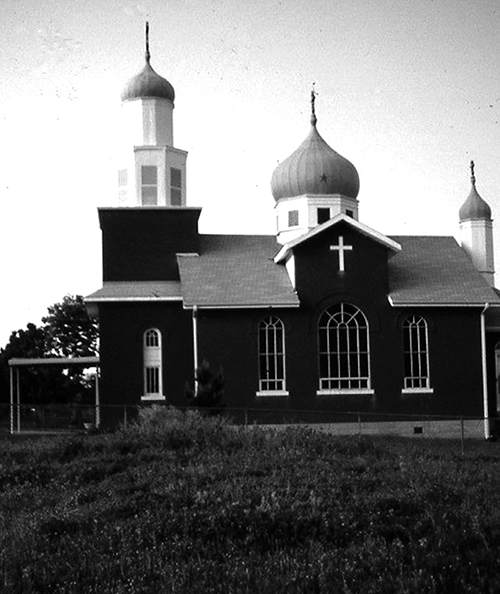 Cyril and Methodius Russian Orthodox Church," The Encyclopedia of Oklahoma History and Culture, https://www.okhistory.org/publications/enc/entry.php?entry=ST002.